Most of this weekend was spent celebrating Mrs. ER's birthday. That included a darn good dinner prepared by me and my daughter. My polenta, mozzarella and veggie crumble appetizers, along with garlic sautéed broccoli, were a big hit. My daughter rocked her chicken parmigiana and Francesco's provided the cake, napoleons and rainbow sponge cookies. Needless to say, we all took the day off from watching our calories. I've done a good job reducing the amount of processed sugar I consume and expected to wake up feeling like I'd overindulged. I actually felt great this morning and ready to cover a few miles. That may have been due to having a full supply of glycogen in my system. The outside temperature was in the mid-30's with a light wind that made it seem even colder. 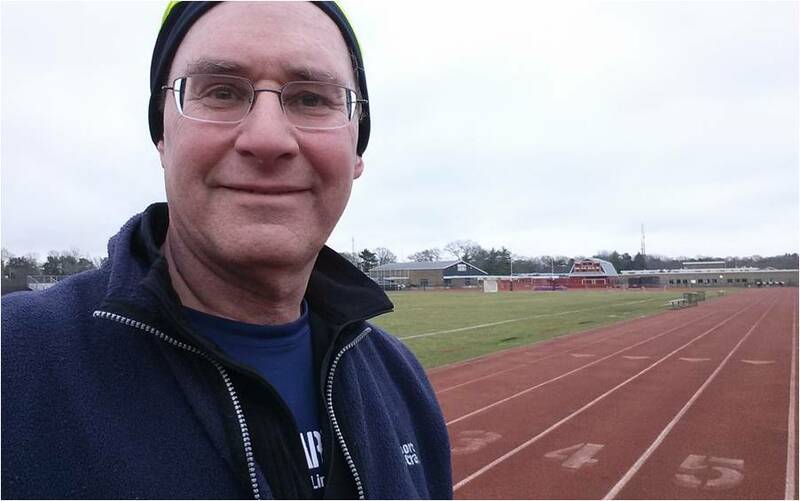 I didn't feel like running around my boring neighborhood streets again, so I headed over to the high school to run boring laps around the track. In truth, I never find the track boring. Despite the repeatable view and unchanging surface, I appreciate the serenity of the place. That was especially the case on a day like today where I had the entire track to myself. One likely reason that I was alone (besides the early hour and overcast sky) was the cold. I wore track pants and a couple of sweatshirt-weight top layers that kept my core warm. Even though I brought mid-weight running gloves, my hands were freezing for the first twenty minutes. It was especially bad when rounding the southwest corner of the track where the wind hit me head on. I didn't bring el bandito mask today and regretted it until I finally warmed up. Since there was no one else on the track, I was free to run in whatever lane I wanted. Better still, I was able to close my eyes for a few seconds as I ran without fear of collision. I thought I was running straight and was surprised to see that I'd crossed over into the next lane. I've always thought running that way would be a Zen-like experience. Now I know not to try it on the treadmill. I ended up doing 16 laps and running the last mile much faster than the first three. When I picked up my pace I felt like my running got somewhat easier. Is there something to that? Is there a threshold of efficiency when running slower actually takes more energy than running faster? I would have put that further to the test but I hit my targeted four and called it a workout. On my next run I'll increase my speed a little more than my natural pace to see how long I can sustain that. It's worth a try and probably a better idea than running with my eyes closed again. I only drive with my eyes closed when I'm using cruise control because that's the same thing as auto-pilot, right? I'm glad to see that your tenuous grasp on reality is still in place since you realized you were watching the movie and not actually in it.